Three Bath | 1,408 Sq. Ft. This two bedroom provides residents with three bathrooms and an extra long balcony. The full-service kitchen is equipped with a pantry. The living/dining room is 16’2”x 24’9” and is connected to both the master bedroom and secondary bedroom. 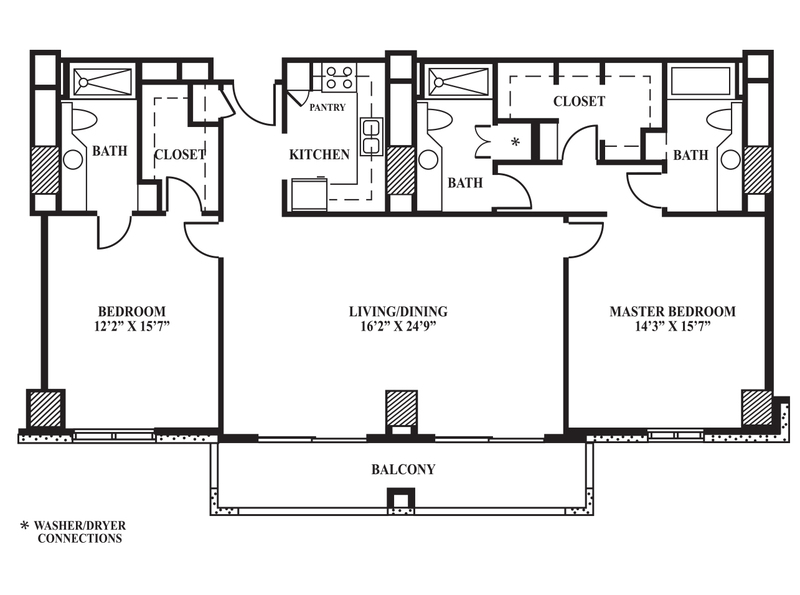 The master bedroom of 14’3”x 15’7” consists of an extra large walk-in closet located between two bathrooms. One bathroom comes equipped with washer/dryer connections. The secondary bedroom is 12’2”x 15’7” and also connects to a bathroom and walk-in closet. This unit is offered on floors 3-22.
and we will contact you to setup an appointment.